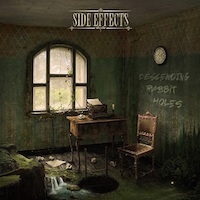 SIDE EFFECTS are an eclectic power trio based out of Zagreb, Croatia. The band has released 3 albums before this release entitled “Descending Rabbit Holes”. The band has played many live shows including shows supporting Paul Gilbert (MR. BIG, RACER X) and Richie Kotzen (POISON, MR. BIG) and headlined the guitar festival Guitar Master in Zagreb. This album contains 9 tracks and a total of 43 minutes 51 seconds of music. The opener “Don’t Contradict the Facts” has some nice pounding drums and a really nice groove to it. I would say there is a touch of VAN HALEN and even with a modern sound, it has a bit of that old school YNGWIE MALMSTEEN feel to it, especially in the vocals which do remind me a bit of Jeff Scott Soto. There are some cool transitions as well in the guitar riffs, that pure hard rock feel to it, akin to SCORPIONS in the 90s. The chorus is also very catchy. “In The Shadow of a Crumbled Fort” has a very interesting feel to it, it almost sounds like JIMI HENDRIX because of its bluesy rock approach, the guitar tone is similar to STEVIE RAY VAUGHAN. I could definitely see a song like this play on the radio, the closest resemblance I can think of is CHICKENFOOT, but with a lighter touch in the middle section that has a tinge of progressive rock (think THE FLOWER KINGS). The band really meshes its influences well together on this one. “Scratch the Surface” uses a much heavier approach, almost progressive metal, that you could compare to SONS OF APOLLO, but the vocals here are a bit more along the lines of TREVOR RABIN (YES), which has that 80s undertone to it. I guess you could also compare this to 80s DEEP PURPLE with a bit more power to it. This is a highly enjoyable track to listen to. Also a shout out to the guitar solo on this one which definitely packs a punch. “Colorblind” is that head banger piece of music you want to play loud in your car; it just has that special factor to it, very rich and energetic not only its tones, but also in its delivery. For sure this will be a crowd favorite. “Don’t Turn Away” is a softer piece and has that WHITESNAKE appeal to it. It’s an easy-listening track but has a very powerful chorus, very alternative-like (a bit like CANDLEBOX). One thing we hear better here is the bass track, which has been primarily hidden throughout the guitars. “Diversion” follows the groovy patterns of its predecessors and here you can hear the influence of Billy Sheehan, it also adds some interesting layers to the vocals with some added special effects. The song as many others, changes its pace nicely from the more energetic rhythm guitars to the slower chorus. “The Siren Song” sounds a like mix between Steve Vai and FATES WARNING, it is by far the heaviest piece found on the album, but its chorus is the complete opposite, it is a very happy-go-lucky melody. It provides a very peculiar juxtaposition. “Hideout” uses more acoustic parts and is the softer piece found on the album. It provides a bit of calmness considering the abundance of powerful riffs present in almost every track. Finally, “Obituary of Common Sense” as the closer is the longest track of the album, it has a progressive approach and ends the album on a very positive note. Overall, every single song here is highly enjoyable to listen to. Every element shines through and the choruses are catchy. Any hard rock fan will find something on this album that will interest them.